We're halfway through the season more or less, so let's take a look at how each ACC Football team is doing. I would have liked to see the Wolfpack play West Virginia, but NC State has done everything that’s been asked of them to this point at 5-0. They play Saturday against Clemson for a chance to make a national splash. QB Ryan Finley is playing at an extremely high level. 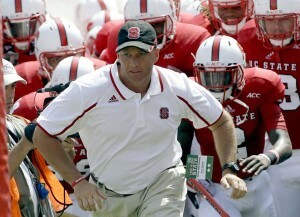 Dave Doeren hasn’t allowed NC State to backup. Clemson’s win at Texas A&M is looking better and better with each passing week. Dabo Swinney navigated a potentially tricky QB situation with Kelly Bryant’s departure, and the Tigers are 6-0 and squarely in the playoff chase. Clemson is still Clemson. At 5-1, Duke has the just 1 hiccup loss at home to Virginia Tech. They have wins at Baylor, Northwestern, and Georgia Tech. David Cutcliffe successfully managed a number of injuries early in the season to have the Blue Devils in position to contend in the Coastal Division during the 2nd half of the year. Virginia’s win over Miami gives them an A grade at the mid-point of the season. At 4-2 the Hoos are in great position to reach a bowl game. Bronco Mendenhall’s team is going to be tough out. They are a physical bunch, and QB Bryce Perkins continues to develop. Syracuse was close to getting an A, but they have lost their last two games. The loss to Pitt was a bit of surprise. They are still 4-2, and putting up a lot of points. If feels like Virginia Tech should be worse than a B-. There’s the catastrophic loss to Old Dominion, and the ugly 2nd half against Notre Dame. Defensive issues are showing up too. Through it all though the Hokies are 3-0 and the leading the Coastal. Charlotte is still in site. That loss at Purdue was messy, but there’s no shame losing to NC State. BC is 5-2, and could have still have real strong season. AJ Dillon has had some injury problems, but this is still a dangerous team. Pittsburgh has been routed a couple of times, and has a very ugly loss to UNC. They also sit 2-1 in the Coastal and nearly beat Notre Dame. That’s the epitome of an average team with equal parts highs and lows. Miami has a solid 5-2 record, but let’s not kid ourselves the Canes have been a big disappointment. They got blown out by LSU in their opening game, and just lost to Virginia in a poorly coached game. They now have a QB controversy that didn’t need to be there. Wake Forest is sinking fast. At home against Clemson they lost 63-3. They have yet to win a conference game, and defensively they are a disaster. Early in the season FSU had an F for their play, but in the last couple of weeks there have been some signs of life. If FSU had held on to beat Miami, I could have given them a C.
For just a moment following a 66-31 win at Louisville, we thought the Jackets could earning a passing mid-season grade. Then they fumbled their way to loss against Duke. There have been glimpses of a competent team, but the Jackets have been too sloppy sustain anything. The Tar Heels have won just 1 game so far this year. They lost to a bad ECU team early in the year, then blew an upset of Virginia Tech with a goal-line fumble. UNC has just found different ways to lose. Louisville is the only ACC team without a conference win along with Wake Forest. They lost at home by 35 points to a mediocre Georgia Tech team. They are not good on offense and they are not good on defense. The Cardinals don’t do anything well, and may not win more than 1 game the rest of the season.